A vandalism spree in Mewsbrook Park is showing no sign of stopping as pressure builds for a meeting with police bosses. As previously reported, the Littlehampton park was targeted by vandals who cut down several saplings. Friends of Mewsbrook Park chairman Clive Fennell condemned the act and reported the incident to the police – but he said this has not deterred them. Other young trees were pulled up and hedgehog boxes were smashed, grafitti was daubed on buildings, life buoys were stolen and pampas grass and a picnic bench next to the play area was set alight. Most recently, the safety chains in the boating lake were broken and two coots nests were destroyed, likely killing the chicks that were about to hatch. Mr Fennell said: “The mothers have spent all those weeks sitting on these eggs just for it to be destroyed by a couple of kids having fun. Sussex Police confirmed it received a report on Tuesday, May 9 that damage had been caused to the lengths of chain and two young children were seen nearby. No arrests have been made. According to Mr Fennell, the latest incident was committed on Saturday, May 6 by a boy and a girl aged around 10 years-old who were with a group of teenagers. One eyewitness saw the pair break the chains, and then start hitting the coots nests with them. They were challenged on more than one occasion before being moved on. When they were told what they were doing was dangerous, one replied: ‘my mum lets us do this’. Mr Fennell said the children were drenched and covered in mud from the lake. Anyone with information about this incident can contact Sussex Police via 101@sussex.pnn.police.uk or call 101, quoting serial 666 of 09/05. 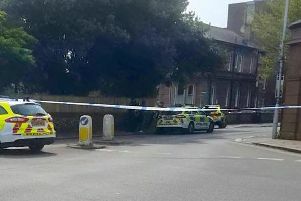 This comes as Littlehampton Town Council’s clerk Peter Herbert confirmed he would set up a meeting with police and crime commissioner Katy Bourne after Mr Fennell and other residents criticised the force’s response to vandalism in the town. Littlehampton town mayor Ian Buckland said the incidents in Mewsbrook Park are ‘hugely disappointing’. He said: “Residents need to be assured that the police are available to respond to their calls; investigate crime and protect them, their property and their community. Katy Bourne said she stayed ‘closely connected’ with the town council and was looking forward to continuing their ‘close working relationship’.